This is because some of them contain a few ingredients including alcohol, which can be very dangerous during pregnancy. In fact, most of the medicines for cold can cause problems to the fetus. Thus, if you catch a cold during pregnancy, you should talk to your doctor about it and ask if you really need medicines. If you do, he will give you medication that is safe for pregnancy. Here are some of the drugs that can be taken during pregnancy to ward off the common cold. An expectorant works against the mucus secretions. It is common knowledge that common cold leads to the secretion of a lot of mucus. Expectorants thin these secretions in the respiratory tract so that breathing is easier. However, you should not take this medication in the first three months of pregnancy. Guaifenesin is one expectorant that is given to pregnant ladies. However, it is a Category C drug, which means that in animals studies it showed adverse effects and studies have not been carried out in humans. If you can avoid it thus, you should. Common cold brings cough with it. Sometimes cough is severe and very frustrating. Cough suppressants can suppress your cough. A common cough suppressant is dextromethorphan, which can treat a dry and unproductive cough. However, this is again a Category C drug and as aforementioned, it is not clear whether it is safe for humans to take. Because of this you should first talk to the doctor and discuss the potential risks to your unborn child. Only if everything seems to be safe should you take the medication. These will get rid of the pains and aches that you feel when you catch the common cold. Acetaminophen (Tylenol) is one drug that has the nod. It is considered safe for pregnant women. Experts have classified it as a Category B drug. This means that the drug was found to be safe in animals or that any adverse effects seen in animals were not replicated in humans. Thus, it is a safe medication. It can alleviate pain as well as fever associated with common cold. Every other pain medication should be avoided during pregnancy including the very common ibuprofen (Advil) and aspirin. Congestion of the blood vessels in the sinus is also a symptom of common cold. Decongestants will help shrink those blood vessels so that your sinus does not pain. The sensation that your nose is stuffed will also be alleviated. 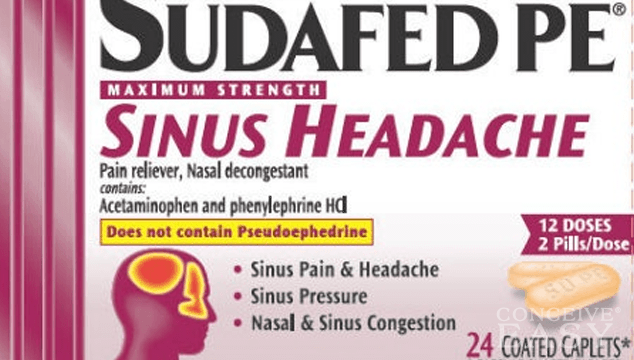 Pseudoephedrine hydrochloride is one decongestant that has been proven to be safe for pregnancy use. It is a Category B drug. Sudafed, Dimetapp and Chlor-Trimeton are brand name examples. Hence you can see that most drugs for common cold are harmful during pregnancy. You need to be careful before popping any of the usual pills if you catch a cold during pregnancy. Don’t make that mistake. Something as common as the common cold also calls for medical attention if you are pregnant. Be safe, learn about the various medicines that you can use, and then use them.